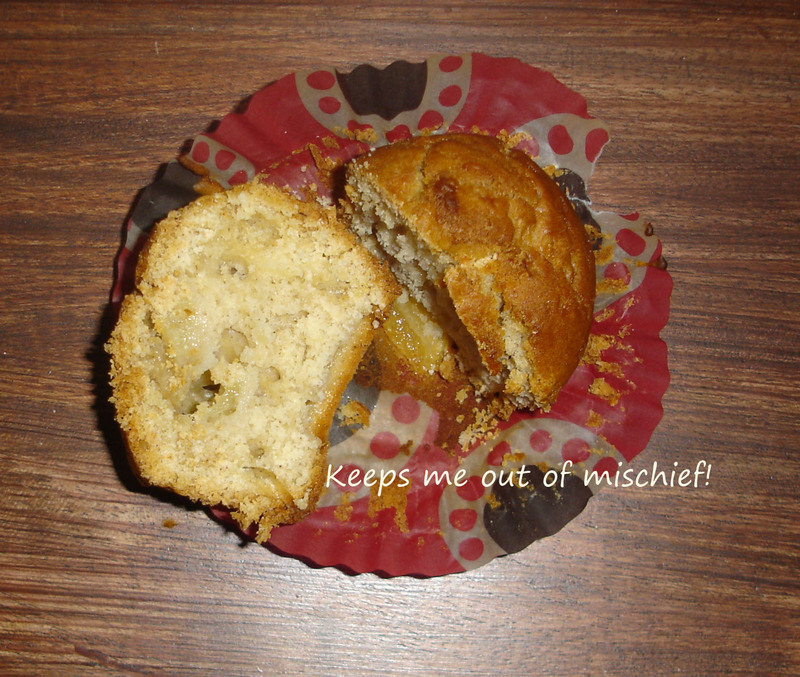 Pear Muffins | Keeps Me Out Of Mischief! I’m desperately trying to find different ways to use up all the pears we have in our garden. I’ve made upside down pear cake and used pears in ‘Herman‘ the friendship bread. I found A Frugal Simple Life’s Basic Muffin Recipe and had pinned it on my Pinterest Cake Inspiration Board. I thought I’d use the inspiration to make some pear muffins. The recipe also gave me a chance to use the measuring cups I’d bought in the Lakeland sale. It’s just as well the recipe was in cups because my weighing scales are in my classroom at work after making bread with my class this week at school! 1 and a half cups of chopped pear. Combine all the dry ingredients then add the wet ingredients and combine. The mixture may be lumpy. Put the mixture in paper muffin cases so they are no more than 2/3 full and bake at 200°C for 25 minutes. This was the first time I’d cooked by volume rather than weight and it seemed a slightly strange way to make things after years of precisely measuring ingredients. A surprisingly successful result! I’d like to take all the credit but it’s actually trees from our neighbour’s garden that drop pears and apples like there’s no tomorrow!